Coconut husk guitar pick, Guitar Pick/Plectrum from Rocky Mountain Slides. Vehuel's review (This content has been automatically translated from French)" Mooojooo of this pick!" The pick is received triangular "Tri-pick", with each tip end. LA is slightly curved shape, providing a natural hollow to place the index finger under the pick. In addition, inside the coconut is rough, it serves as grip, avoiding a pick slip, even due to perspiration. The outside is nice looking pick, leaving the shell of the coconut visible. The thickness is quite thin (1.5 mm) and drive the pick does not harm. 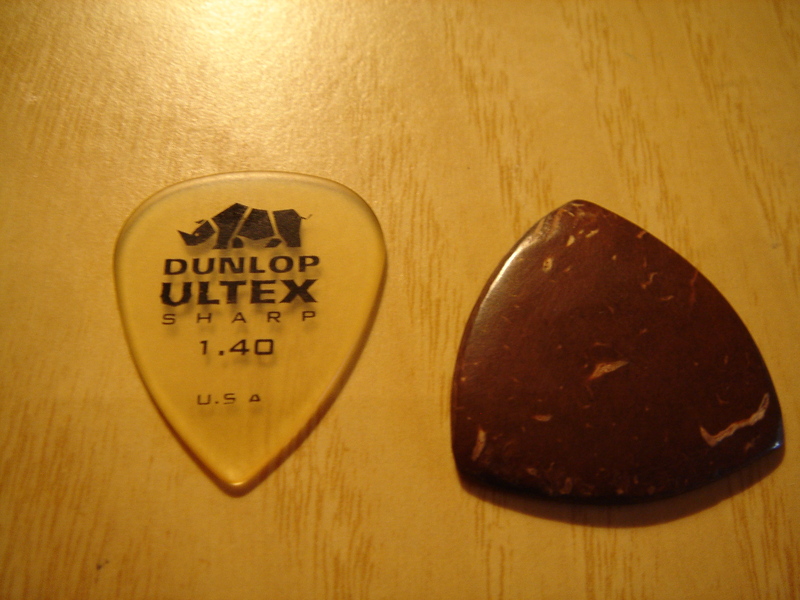 Pick, since the curvature is very comfortable to hold, I think it fits naturally and it is very easy to play with. For cons, the form can also be a disadvantage, because for the round trip, the curve can pick slightly hanging, although this is very rare. Regarding the sound, the sound delivered is both matte and glossy. Brilliant from the tip. The attack is audible, and do not mind. So, the point of the pick gives a little more in the attack, which is very nice, and it's sublime. There's "mojo" in this pick! On the sound spectrum, I think it highlights the low pick, and gives a very warm side to her, while the rest remain audible frequencies. Pick it shines without making shrill treble, even with barre chords. Very nice drive, there is a good punch and compared to other materials I find the pick gives a "vintage" sound. In distortion, I found this great pick, especially solo. This material enhances the grain of my Legacy and each note out well. However, it is less convincing in rhythm with its saturated, it's pretty rough, and it gives more compression. On my folk, pick coconut gives a dull sound very nice lead. We find again the attack of the material that gives a little something to her. In agreement, it is rather high-mids that emerge, giving even to pick a side interest. In the end, this is THE pick good surprise, it proved the least convincing to me, and at the finish, but leaning more on the material, I found a damn thing! 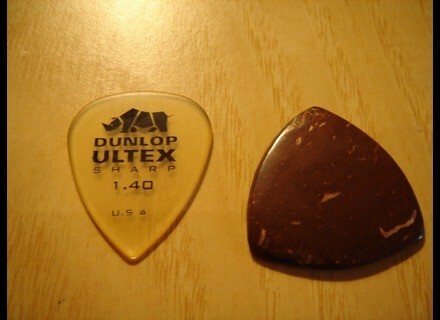 In terms of wear, I think the pick could well be on the long term. I highly recommend the game for its clean, overdrive and lead full, but also folk.